305 Manor Gardens - Ballito Central Accommodation. This establishment has active specials running. 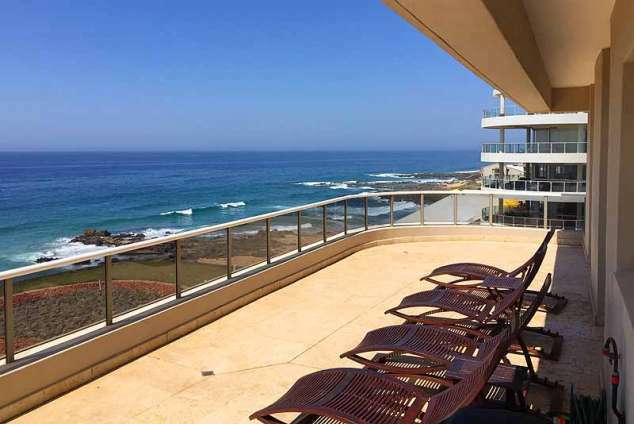 Situated along the very popular Willard Beach in Ballito, 305 Manor Gardens offers self-catering accommodation in a spacious open plan living area and 3 bedrooms, all with en-suite bathrooms, sea views from your bed, and direct access from each room to an unbelievable wrap around balcony. The apartment has free dedicated undercover parking and has 24-hour security and access control. This fully air-conditioned apartment comes with modern decor and a fully-equipped kitchen with dishwasher, washing machine and tumble drier. There is also an open-plan dining and lounge area with satellite TV and DVD. Guests can relax on the huge balcony, which has BBQ facilities and tasteful outdoor furniture. The apartment is conveniently located across the road from a supermarket, pizzeria and great seafood restaurant. King Shaka International Airport can be reached within less than 30 minutes. 10301 page views since 17 Mar, 2016. Last updated on 05 Apr, 2019.